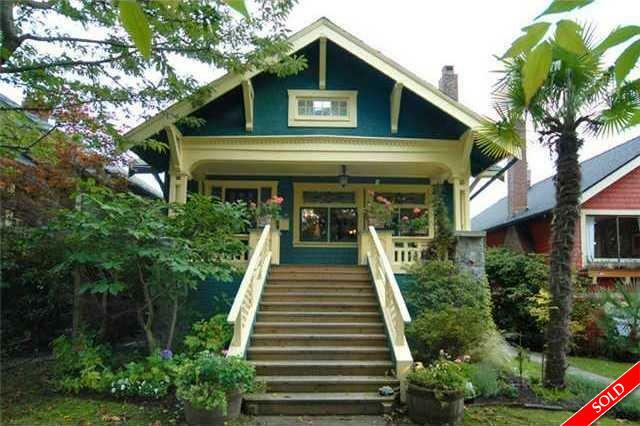 Description: Fabulous, large, 1914 Craftsman Character home on one of the prettiest blocks in Kits! This home is over 3,000 sf! There are 3 bdrm up, 2 bdrm on the main and a wonderful updated 2 bdrm suite down (rents for $1,350 inclusive). Spacious renovated kitchen w/bright E/A, S/S appls, lovely LR and DR w/9' ceilings, beautiful refinished floors, wain scotting and original, elegant, stain glass windows thru out! A huge priv deck off the kit looking onto the garden is great for entertaining. The location is superb, walking distance to all schools, shopping, parks, buses, just minutes to UBC and downtown. This home has been lovingly maintained thru out the years and is very special! PUBLIC OPEN: SUNDAY 2-4 PM.